Edraw Infographics Software covers rich music elements including huge awesome set of instrument icons you may use to design a music infographic. Edraw Infographic software equips with almost all instrument clip arts and music-related symbols for creating a music infographic. All of those symbols and icons can be edited, you can choose any of them and modify the colors, dimensions. What's more, it includes 10000+ infographic elements such as news, weather, tourism, fashion ,etc in this program are all available to meet your different needs. You are allowed to draw custom elements to meet your special needs with Edraw built-in easy-to-usedrawing toolkit. 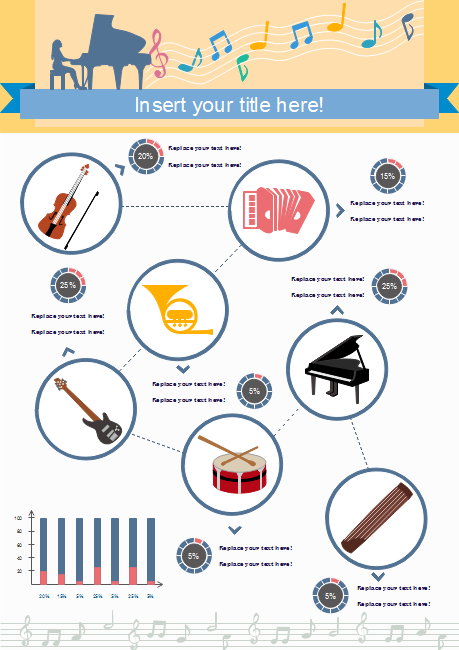 Here is an example of infographic music icons application, you can use this music infographic to do a hobby research by analyzing which instrument are most popular, thus you can plan courses accordingly. Want to use the above music elements in your infographics? Download Edraw Infographic Maker! It includes a large variety of music shapes which are easy to modify. Design a wonderful infographic is just a few click away. Try it now!